This dark green, humble looking cart is as important to the family as an heir is to a King. This 14 year old EZ-GO was the last vehicle my grandfather bought, he passed away in 2006 and this cart represents him and what he loved doing the most. The decision to change this cart to buy a new one has come up several times, but we have always walked out of the deal for the fear of loosing something so significant to my family. A new one has come by, but for the people in my family who plays golf (My aunts, my father, and I) this cart has much higher value than any other. This is a 2001 EZ-GO PDS version in dark green and gold accents. This is as basic as you can get a golf cart which does its purpose of moving you from shot to shot without you having to carry the golf bag. It will also hold your drinks. These days you can get golf carts with headlights, stereos, leather wrapped wheel, cooler, club washer etc. But this simplistic approach to a golf cart is as honest as they get, it does what it was designed for, and that is fine by me. 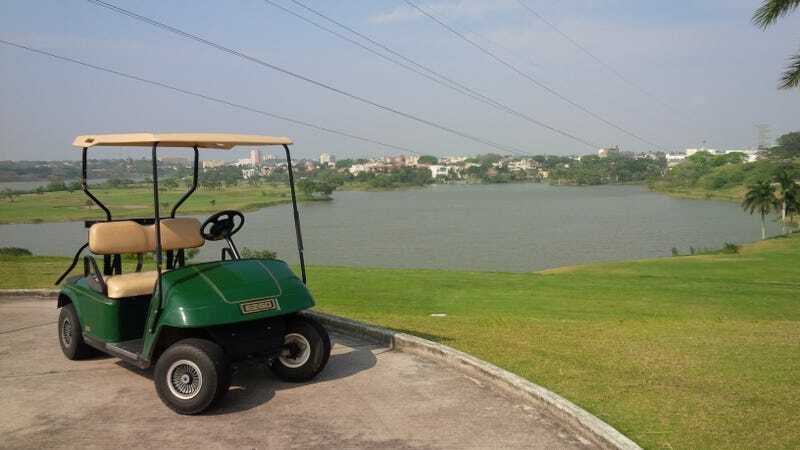 The location of this road test was the Club Campestre Tampico. A country club done by the Englishmen that came in the 1920's to the city when Oil was starting to sprout from our soils. In the beginning, there were only 9 holes, but in 2008 an island was opened to give home to another 9 holes. My grandfather invested in this project in 2005, but never got to see it finished. It is a bite the back of your hand gorgeous place, and where hundreds of memories I have lived by were created. This car also has sentimental value to me since it was the first 4 wheeled vehicle I was able to drive without adult supervision. As I had 13 years old, my father sent a letter to the club permitting me to drive the cart without supervision. This was my passport to a beginners course of what I love doing the most. Driving. I discovered what understeer is, what G-Force feels, how hard braking, cornering, and accelerating in a rhythm made me a better driver. I connected with it, I bonded with it, and thats why my first Oppo Review had to be dedicated to this. My instructor, my liberator, my companion, and one of the most important machines of my life. This cart has the same appeal as steelies. It is so simple and uncumbersome it shows off a rudimentary beauty that I appreciate. Its discrete in showing off, and I respect it for that. Newer, better equipped cars may come with lights and sporty rims, but this is the basis of everything. This is the image everyone thinks of when they think "Golf Cart". All complimented by the dark green, gold accents, and several spoked hubcaps to give this an elegant look. This is the interior. You can hose it clean. You sink into the comfy seats. You can now move on. This is a battery powered cart. It is EXACTLY like a Tesla, only your top speed is little lower. Also it is exactly like a BMW in which it is electronically limited to 20MPH. It is powered by 8 Trojan batteries the size of an ipad. Acceleration though is quite surprising, you sink into the seats if you full throttle it thanks to all that torque. When you get to 20, then it all sets in. This thing has stronger brakes than you think, and they are really difficult to modulate. At first the pedal has little travel to make the stops comfortably, and dignifyingly. But when you go an inch deeper than that it makes all 4 wheels lock. Try braking cautiously without locking up in the tens of hills of the club and you might see that I really gained some skill. Tires squeal like a stabbed Chinchilla, and you make a once silent golf course into a noisy displeasure to the players. When fully utilising the brakes though they stop you fantastically quick. The ride is a bit choppy for a thing thats intended for comfort. But in the end, this was designed to be in the neatest cut grass, and in that environment it is great. No drinks have been spilled. This is where things get interesting. The cart rolls and rolls, and since the seats are basically slabs of foam you have to be sure to be grabbing that wheel. This has the quintessential sports car trait of RWD, but it can also tend to understeer in the corners. Powerslides? The surface has to be fully greased up or something, but most of what I learned about car control in corners was thanks to this guy. The steering offers plenty of feedback through all the nice corners of the coarse. I really enjoy driving it. Its smooth, and does its job fantastically. You can bring your Ipad or laptop and there is a place to put it. There are places to put drinks. There are places for your golf balls.There are places for your golf bags. There are also places for the tees. There are places for pencils. The key is simpleness. It also has a key. And I mean, you are playing golf, that should be the biggest entertainment. You can hear the whining of the batteries ,but the main noises you'll want to listen are the birds in the sky, the squirrels in the trees, and an occasional crocodile eating its prey. This car was the base model, and for that you still get the comfiest seats, the hubcaps, and all of the places to store your things. It probably is worth nothing now, but for something that goes 20 MPH and can teach you some basics of driving whilst being useful for golfing it is pretty good value in my book. Sentimental value speaking, its worth millions. I know this isn't the most exciting thing to ever be reviewed on Oppo, but it means a whole lot to me. I want to keep this thing forever, and let my kids drive it and experience it the way I did. I want this to teach them the edges of grip, the importance of steering feel, weight transfer, the amazingness of a bench seat. I want this to create as much memories for them as it did for me. That is why for my first Oppo Review, I give you this. My 2001 dark green EZ-GO PDS.